A painting made with Van Gogh’s wheat field paintings in mind. Note: you might need to click on the image to get more accurate colors. 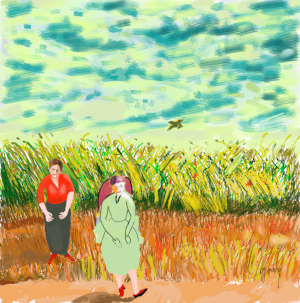 This is after Van Gogh’s “Wheat Field with a Lark.” 5th in the series, starring my wife Peg and my friend Vincent. My wife Peg is in the Night Cafe in Arles, France, made famous by Van Gogh. Original digital painting. I painted a portrait of Manuel, one of the excellent models I have been privileged to work with in Valencia. I put him into my rendition of Van Gogh’s Room at Arles.